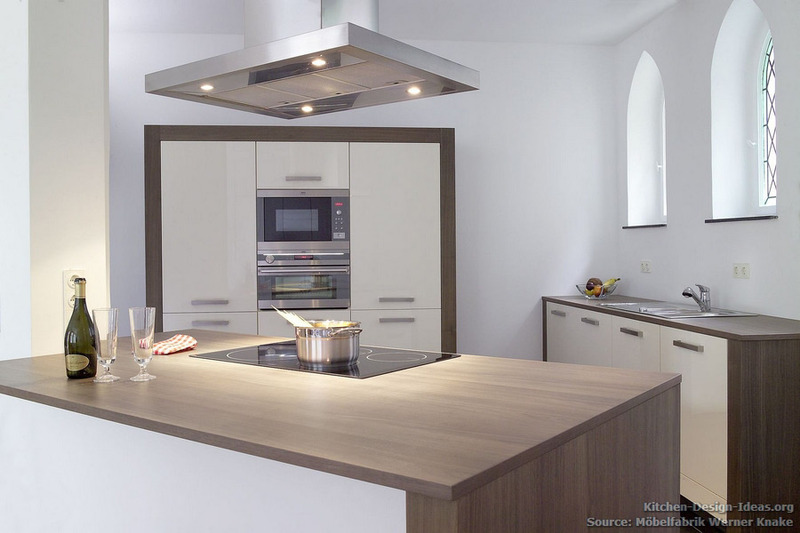 Located in a former congregational house in Germany, this minimalist kitchen adds a decidedly modern feel to this historic space, along with its original stained glass windows set in pointed Gothic arches. Cream-white cabinetry and walnut veneered countertops serve as a subtle warm contrast to the white plaster walls of the historic building while maintaining the simplicity of the room. A unique collaboration of a photographer, two designers, and a century-old cabinet company, this small kitchen makes history in its own little way. The kitchen was a project of the long-time friends Udo Knake and Hartmuth Klemme. Knake is the owner of the manufacturer Möbelfabrik Werner Knake (founded in 1914). 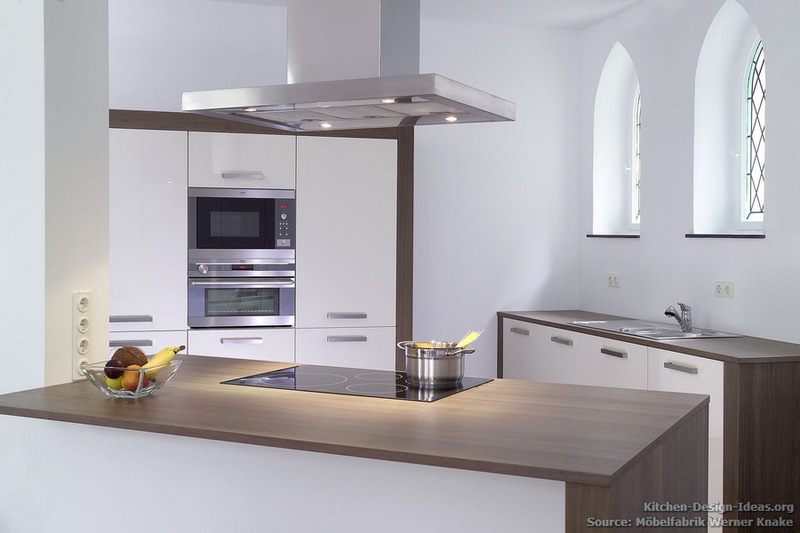 Klemme is a freelance photographer and the kitchen was installed in his studio in Herford, Germany. Arno Honvehlmann supported both men in the design. The triangular layout provides a highly functional work space while maintaining the simplicity of the overall design. 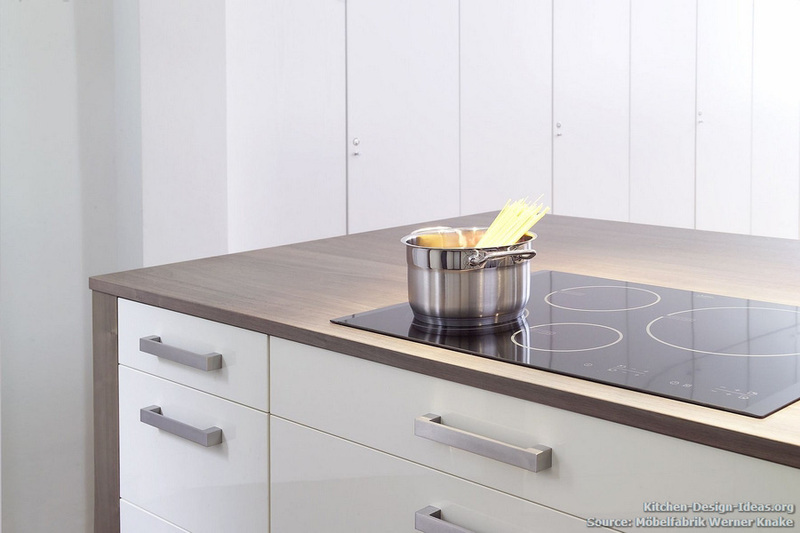 A slim stainless steel island hood provides ample ventilation without obstructing the kitchens open feel. "We wanted to set contrasts," says Udo Knake. The designers achieved this goal through color and style choices. Darker wood countertops provide contrast to the white walls and off-white cabinets. And in comparison to the Gothic arched window styles, the cabinetry has a minimalist design. The kitchen island features an electric induction cooktop along with plenty of drawer storage for pots, pans, and utensils. The high-gloss cabinets in creamy white are framed by walnut panels. 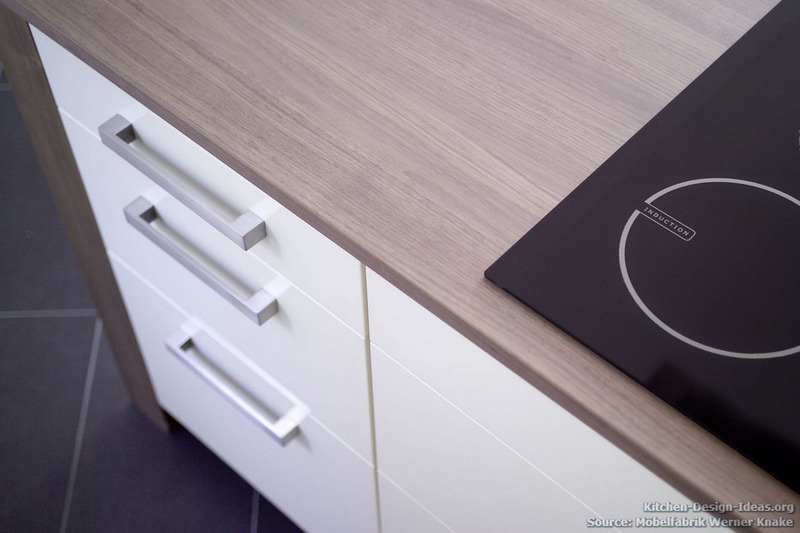 A matte finish allows the wood to maintain a its very natural look. For the wooden parts, Knake included something special: In the low-solvent varnish, they added slate powder as a natural pigment, giving the finish a light, dry tone that maintains the raw beauty of the original wood. Design: Hartmuth Klemme, Udo Knake, Arno Honvehlmann. More Inspiration: If you enjoy this style, you may also enjoy this minimalist kitchen in addition to our gallery of contemporary designs.